I met Che Ponton and Colleague at South Oxhey Police Station. We discussed policing issues and challenges in South Oxhey. We visited shopping parades in South Oxhey and Carpenters Park and talked to members of the public as we went. We also visited residential areas. When the heavens opened we sheltered at The Leisure Centre. We discussed how they worked with the Youth Club which meets in the same building. I hope that next summer it is possible for the Youth Centre to be open during August. It was a quiet night. The weather keeps people inside. 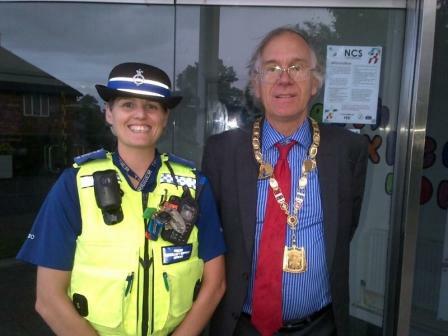 The role of the PCSO’ in Three Rivers is an important one in keeping crime down. I would also suggest if you have not joined OWL and live in Hertfordshire that you sign up for the regular emails. It is important for all tiers of Local Government and the local community to work with the Police to make our neighborhoods safer. Watch this space I will be in action with Police in Three Rivers again soon.